As an avid diyer and fan of the S-5 Electronics K-12 tube amplifiers kits (I have 2) I thought it would be a good idea to get a K-8LS. 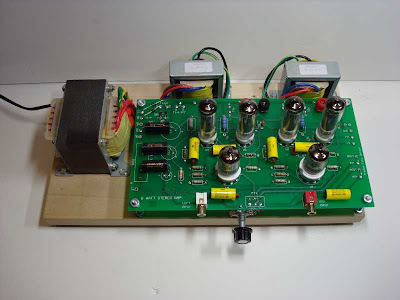 This tube amp kit is a logical replacement for the S-5 Electronics K-12 and K-502 tube amplifier kits. It is about the same power and is aimed at the same budget tube amp market. The basic amplifier circuit topology of the K-8LS is the same as its predecessors. With the exception of an added preamplifier section, it is not a major redesign, and now uses somewhat more readily available vacuum tubes. The one big plus is that it now comes with a much larger power transformer. The original K-12 ones ran rather warm. I really want to like this product, but as you will see in the following comments, mine is awful. 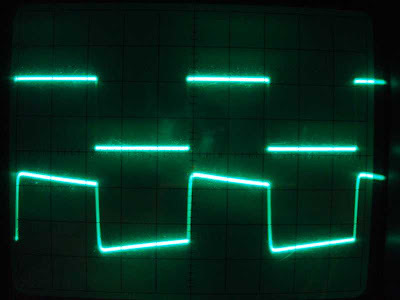 Sine wave and square wave tests were conducted at several frequencies. The measurements were made at 1 volt output into an 8 ohm non-inductive resistor. This is an easy load for any amplifier. Frequencies checked were from 20 Hz to 40 kHz. There was a significant drop in output (sine wave) below 150 Hz and by 20 Hz there was not much left (about 9 dB down relative to 1000 Hz). The high frequencies were down around 3 dB at 18 kHz. 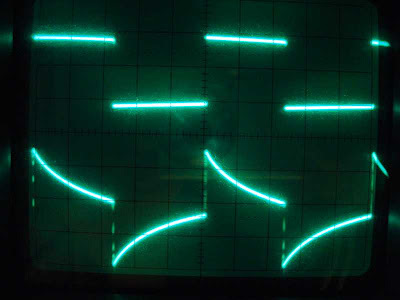 Sine waves at 50 Hz showed clearly visible distortion. Square wave response at 1000 Hz was fair, but with some tilt. By 500 Hz the tilt was significant and below 150 Hz it was excessive. 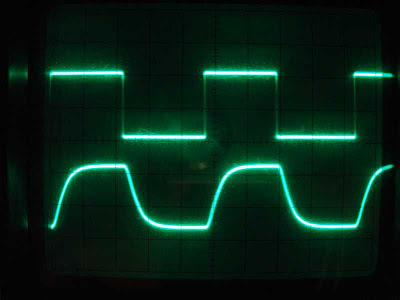 At frequencies below 50 Hz it no longer resembled a square wave at all. On the high side, rounding occurred from about 4 kHz up. 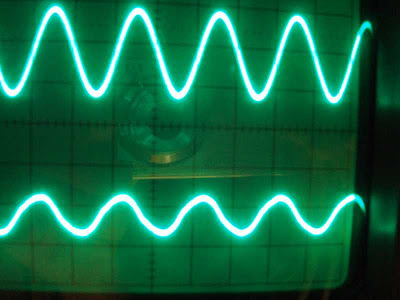 By 10 kHz, square waves looked more like a sine wave! To be fair, there was no ringing or overshoot at any checked frequencies. Now you can see the paradox. I want to like this product, but it is awful! So rather than jump all over the manufacturer, let’s start a dialogue and see if others have the same or different results. I’d like to give the K-8LS a chance, so let’s hear from you about your experience with this kit. I bought a K-8LS amp because I live in Europe and it can run on 230V. I was a bit disapointed (I read lot of good things about K-502) when I listened to it : in my opinion, there was no bass and the power was very low (maybe that's normal, I got 92dB/W/m speakers, 6ohms). Another thing, the internal resistance is about 16ohm (I don't really know much about tube amps, but I think that's high..! ), that makes a damping factor of 0.5 on 8ohms speakers. 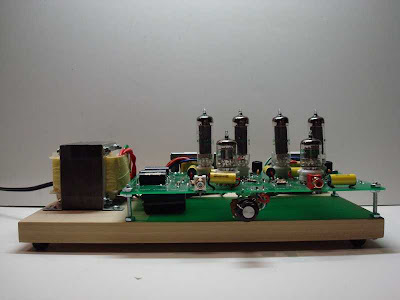 Bruce, thank you for the notes and measurements about the K-8 tube amp kit. I am a novice and was looking at the K-8 as my first kit. I have read many good things about the K-12 tube amplifier kit, so I will try that one instead. Bruce measured the amp to be -9dB at 20Hz relative to 1kHz. That explains the poor bass response. With 92dB speakers, you only need 2 watts of power to produce 95dB which is plenty loud. What kind of speakers are they? With tube amplifiers, a high output impedance (and low damping factor) is common. Ever think of bypassing the preamp circuit? Maybe it is the culprit for the poor sound? Nice idea, I'll try it next time I use the amp. Thanks ! Hi, folks. Despite reading this thread, I bought the K-8LS kit. Took about 4 hours to assemble. I hooked it up to a good cd player and a pair of mission surround speakers. No hum, good volume. But the bass response is, well, unresponsive. Mids and uppers are ok, just not much bass. So here's my really stupid question: Where does the bass response live in a tube amp, and how can I improve it on this little critter? I'm not a good book learner so advice would be appreciated. Thanks! To get more bass you will need to use larger audio output transformers. I built one of the K-16LS amps (actually the first one sold) last year, and found it lacking in bass response, as seems to be the case with the K-8LS. I changed the six signal coupling caps to WIMA 0.15 uF / 400V and bypassed the shared 6005/6AQ5 cathode resistors with 470 uF / 35V caps, and changed the NFB ceramic disc caps to silver micas. I did notice a decent improvement, but the overall sound quality was still not up to what I thought it should be. Next step will be to change the output transformers. The K-16 uses different (approximately 5K) outputs than the K-8. I'll try some Edcor or Hammond 5K UP PP OPTs. Just about anything should be better than the supplied OPTs. I would suggest upgrading the PSU caps (I see that you have done that in your K-8), as they are run very close to their voltage ratings, and that can cause premature failure. I have previously built, and heavily modified several of the AES K-502 11BM8 amps, with excellent results, and I hope to make the K-16LS achieve similar performance levels. would you suggest I replace the stock on es with? I bought a 16w S5 kit, and just finished it. It took many hours due to my novice status as an electrcian and slow solderer, plus I built it into a Hammond case which took time to cut up. I went with Hammond 1615 output transformers to get more bass out of it, and I upgraded the caps too. I ordered the tone control kit for it as well. The result? It sounds terrible! Very poor bass, and muddy mid tones. I'm very disappointed in the quality after heraing such great music from high end tube amps. I wish I saved my money and picked up a nice SS amp. Oh well, live and learn. The only good thing I can say is that the power of 16w was impressive- more than enough hooked up to my Infinty bookshelf speakers. Buyer beware. Judging from the reviews one would be lead to believe that this amp (the 8ls one) is bad. Is this true? Would it still be true if the intended purpose was as a functional kit to learn how to a) build one and b) how they work ? I would suggest getting the K-12G kit. Power output is the same and it sounds wonderful and about $25 less. You will learn just as much and you will enjoy the amp. I built the K16LS amp last year. I replace the kit capacitors with "orange drops" and Nichon electrolytic capacitors and replaced the kit pot with an Alps Blue Velvet potentiometer. I used the supplied transformers and added dual inputs for both a tuner and a cd playerwith a selector switch. Everything was inclosed in a custom enclosure I built out of oak and aluminum with front and rear panels that I designed with Front Panel Express software which they manufactured for me. I know have about 100 hours on the amp and it sounds great! It's not as good as my Jolida tube amp, but it's darn close! If you take your time and build it carefully, you won't be disappointed! I am looking to purchase a k16ls kit in the next few weeks and I must admit I am somewhat of an amateur with tube amps. I figure this would be a fun project. I have read that a few of you replaced the original caps with orange drops. Can someone please tell me what specific ones I need to order. I also see that the OPTs should be replaced for better bass.. Are there any models that I can drop in without modification to the schematic? Thanks all for your help in my first build. Is there any consensus / opinion as how to get bass from this? I just built mine and love the clarity of the uppers, and the smoothness, but the bass is terrible to none. There must be an upgrade path for this that will give us some real bass? I also built the K16LS amp and despite the bad reviews I must say that mine works VERY well: the sound us loud & clear and also the bass is wonderful. I paired it to an 45-year old pair of speakers made as a kit (can't tell which make, nothing written on the driver units). Trying to connect to my AR 48 speakers gave very poor results, so one should find the right speakers for it. also ultralinear can be helpful. In my blog eugpoh17.blogspot.com I have a comprehensive study of a tube end amplifier using ECC83 and 4 x EL84 with a Hammond mfg 1760J output transformer.